April 2, 2019, 2:26 PM · In an effort to promote the coverage of live violin performance, Violinist.com each week presents links to reviews of notable concerts and recitals around the world. Sandy Cameron performed Danny Elfman's violin concerto, "Eleven Eleven," with the Royal Scottish National Orchestra in Tucson, Ariz. The Scotsman: "It was a whole body experience for her. For this was not just a showcase of astonishing violin virtuosity. Every note, every expressive musical nuance, was matched by choreographed body and footwork that was nimble and beguiling, gorgeously balletic one moment, wantonly shimmying the next." The Herald: "The Hollywood composer wrote the concerto with its soloist Sandy Cameron in mind, and she has been, so far, the piece’s sole performer.... she is an extraordinarily gifted fiddle player whose performance background is always apparent in her gymnastic playing, but never at the expense of the music." Alexander Kerr performed the Mendelssohn Violin Concerto with the San Francisco Symphony in Champaign, Ill., and in Lincoln, Neb. The News-Gazette: "Kerr played the solo part with firm control, and with subtle phrasing of Mendelssohn's melodic line." The Daily Nebraskan: "He is an incredible violinist, mixing skill and passion that made for a captivating visual and auditory treat. Although clearly exerting himself, he somehow made his playing seem effortless." Lincoln Journal-Star: "Precision in runs and arpeggios marked Kerr’s stance with this classic. Good interaction between Kerr and the conductor was key to the success of the performance. After a swift opening, Kerr launched into the sweet second movement, full of emotional melodies." Anne Akiko Meyers performed in recital with guitarist Jason Vieaux at Sonoma State. San Francisco Classical Voice: "Meyers bent her solo lines like a human voice, sliding into notes and connecting them with the greatest of care. Her sound became increasingly intimate, with a miraculous pianissimo at the end." Patricia Kopatchinskaja performed in recital with pianist Polina Leschenko at Lafayette College. The Morning Call: "Rarely have I heard such an invigorating, yet unsettling performances....Every musical line was treated as a separate statement, punctuated by glistening glissandos and furious pizzicatos. Leschenko was equally expressive, exploring her own musical ideas rather than merely enforcing Kopatchinskaja’s." Tessa Lark performed in recital with pianist Jeewon Park. The Boston Musical Intelligencer. : " Lark immediately seized the listener with a bright, secure tone and bold projection, and Park complemented her well with a smooth and even-keeled articulation." Esther Yoo performed Prokofiev's Violin Concerto No. 2 with the Cincinnati Symphony Orchestra. 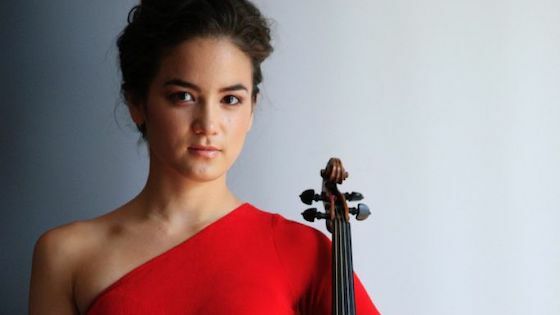 Cincinnati Business Courier: "In her debut with the Cincinnati Symphony Orchestra on Saturday, Yoo, a 24-year-old American-born violinist, was a real discovery." Simone Lamsma performed the Sibelius Violin Concerto with the Adelaide Symphony Orchestra. In Daily: "She was immediately in vigorous command, extracting the most from the “Mlynarski” Stradivarius on loan to the ASO. There is an anxious fussiness in this passionate piece; also yearning, querulous, sorrowful, and tender tones. It requires fast and precise playing, and Lamsma was on top of every such nuance with her animated playing. When able to pause, she immersed herself in the orchestra’s sound, swaying and twitching with its rhythm"
April 3, 2019 at 12:49 AM · Sandy Cameron has some cool crossover and rock stuff on YouTube.